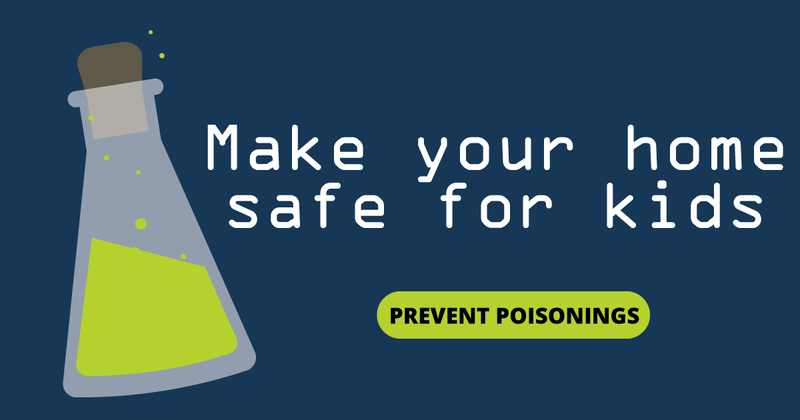 If you have a child at your house (even just for a visit), poison-proofing is a must. Common household items such as cleaners, cosmetics and medicines can be poisonous. Scroll down to learn about potential poisons in each part of your house and what you can do to help keep kids safe. You should also have the poison center number—800.222.1222—by or in every phone. Store cleaning products where kids can’t see or reach them. The safest place? Up high in a locked closet or cabinet where food is not stored. If you must keep cleaning products under your sink, use child-safety latches that lock when you close the cabinets. Put potentially hazardous items away right after each use. Don’t mix cleaning products. Some combinations—such as chlorine bleach and ammonia—can produce dangerous gases. Store all medicines where kids can’t see or reach them, such as in a locked cabinet. Don’t flush medicines down the toilet unless the package says that’s OK. Don’t toss medicines directly in a garbage can, either. Mix unused medicine with something unpleasant, like used coffee grounds. Then seal the mix in a zip-close bag and toss it in the outdoor garbage can. Or find out if a local pharmacy or police department has a drug take-back program. Keep often-used items like toothpaste or soap in a separate cabinet from anything harmful. Store items such as paints, pesticides, gasoline and antifreeze where kids can’t get to them, such as in a locked cabinet. Never put chemicals, like paint thinner or gas, in jars or bottles, where they might look like food or drink. Open the garage door before starting your car. And never leave an engine running inside a garage, even with the door open. Make sure guests don’t leave pills where kids can find them. Keep candles or lamps that contain oil out of reach of kids. Install smoke detectors and carbon monoxide alarms outside sleeping areas. Lock lawn and garden products in a cabinet or shed. Before using pesticides, make sure kids and their toys are out of the area. Don't decorate your home or yard with plants that may be poisonous to children or pets. Never put lighter fluid or other harmful substances in jars or bottles, where they might look like food or drink. Read all labels and follow recommendations for safe use. Never leave cleaners, medicines or other products out when kids are near. If you need to answer the phone or the door, take the product or the child with you. Have fuel-burning heaters, such as stoves and furnaces, checked yearly. Was your home built before 1978? Consider testing for lead paint. Keep kids away from chipped or peeling paint. BE READY IF A POISONING DOES OCCUR. KEEP THE POISON CENTER NUMBER BY OR IN EVERY PHONE.